I had been wanting a way to create a vertical herb garden for our front porch in order to maximize space. Our front porch isn’t tiny, but a linear herb garden wasn’t ideal- so, like big city architecture, I needed to go up, not out! And an upright, standing shower caddy was an excellent option for holding potted herbs. This post contains affiliate links for your crafting convenience. Now, I know what you’re probably thinking- eww, gross, a secondhand shower caddy. And I get that, I really do! But that’s what gloves, a good cleaning, and spray paint are for, right? Plus, I really need to put my money where my mouth is when it comes to buying secondhand…as much as possible. So, let’s get to it! First order of business was cleaning it as much as possible. Using a scrubby metal wire brush, I was able to remove a lot of the grossness. I wore gloves and did it outside, so it really wasn’t all that bad- I swear! And canned air (an unsung hero in my crafty, cleaning world) blew away the scatter from my brush. Now relatively clean, I got ready to spray paint the standing shower caddy. I used a dark bronze paint to give it a fresh, but vintage-y appearance. Of course, this is a completely optional step. But, I’m not a huge fan of chrome and wanted something darker for my vertical herb garden since it’ll be living on our front porch. ANYWAY, let’s focus on the surviving seedlings! I easily tore off the top portion of each muffin paper and used a plastic spoon to scoop out my potted seedling! So, it worked really, really well- making it super easy to transplant into a larger pot. I used 5” jiffy pots for my plants because they fit my caddy the best. See? My little seedlings are ready to flourish (and can be separated and repotted again later, as needed). And yes, I know the jiffy pots are only temporary- which is fine! I’ve got raised garden beds in the backyard that I can transplant these into later on when the plants are bigger! But for now, these potted herbs are exactly what I need. After repotting everything (including herb plants purchased from a local organic farm…to subsidize my garden, thanks to Cottonball! ), I placed them in my standing shower caddy. Of course, I couldn’t leave well-enough alone and created a Spring porch vignette with my salvaged picket fence. An antique rake head hangs on the fence and holds some garden tools and my vintage watering can for easy access. Plus, it just looks cute and cheery! What a perfect vertical herb garden for a small space like a front porch or balcony. And a great way to upcycle a standing shower caddy, if I do say so myself! 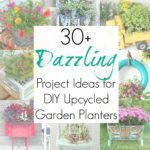 If you like this upcycling idea, then you may be interested in even more inspiration for upcycled garden planters with this post! Hmmm…nice use of the shower caddy! I could use something like that! And, the picket fence piece! I love those, but I don’t think I’ll ever be able to use them in my yard. I’ll keep my hopes up, though. That’s a great idea. It looks like it was made to be an herb garden. I love how that turned out!! What a great idea! Ingenious! 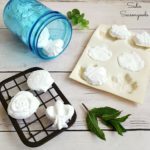 I’ve been looking for ideas for a mini herb garden. Thank you for sharing at Vintage Charm. Great idea to us the shower caddy! Thanks, Michelle- and will do! 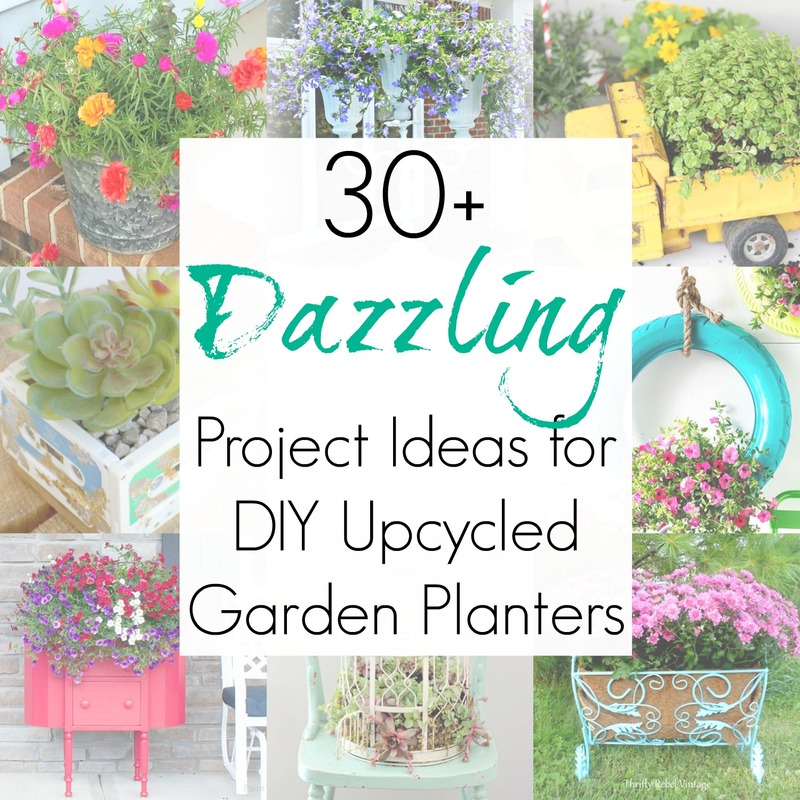 You put me to shame with your creative up-cycling!! Did you see my vertical herb garden this week? Of course I am not nearly as creative as you, I went out and bought the things to assemble mine! Enjoy those herbs! Thanks for sharing at Celebrate Your Story!! The picket fence is a nice backdrop for the caddy. You must be the envy of the neighborhood and I would love to be your neighbor. Thank you for sharing with us this week at Celebrate Your Story, and I hope your week is going great. When I walk into a thrift store, know what I mutter under my breath these days? WWSSGD? And since no answer comes, I’m leaving the genius up to you. Continue on. LOVE this idea! LOVE. IT. I need #WWSSGD? on a t-shirt, stat!!! Thank you so, so much for the party love. Pinning the party collage right now! Me again! 🙂 Just wanted to let you know this will be featured tomorrow at the Farmhouse Friday link party #3! Thanks, Michelle!! I will be there with my latest farmhouse project post! Where Can I Find A FREE STANDING Shower Caddy? (Even A New 1 Like That) Actually, I went on a “perfect” shower caddy search a couple of years ago to use in my shower and besides the price varying hugely, even when the quality didn’t, was basically 2 different design shower caddies that hung all their weight around the shower head or ones that had a vertical tension rod that had to be braced between the floor & the ceiling. All the rest were not much bigger than a bar of soap and usually 2 tiered. The shower caddy pictured is much bigger than what I saw unless it originaly costs over $115 (my search limit). Thanks! Hi, Kris- this one is similar to what I found at the thrift store (affiliate): http://amzn.to/2qdyHqW Would that work? I have a question, what happens when those pots fall apart? Aren’t they meant to be placed in the soil so we don’t disturb the roots? As long as you don’t overwater your herbs, these pots will hold up ok- but I have every intention of transplanting them. I just needed 5″ pots to fit my specific shower caddy and couldn’t locate plastic pots in time. Great idea! Perfect for a garden DIY, you did a great job. Thank you so very much, Maria!